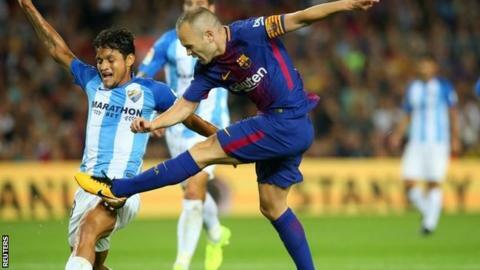 Andres Iniesta scored his first goal in over a year as unbeaten La Liga leaders Barcelona saw off winless Malaga. Barcelona led within two minutes as Gerard Deulofeu scored his first goal for the club, but it should not have counted as the ball went out of play before Lucas Digne's cross. Their second was less controversial as Lionel Messi found captain Iniesta, whose deflected shot flew past debutant keeper Andres Prieto - his first strike since scoring against Celtic in the Champions League in September 2016. Malaga - who did have chances to score - remain bottom on only one point, having only scored three goals in nine games. Barca, on the other hand, have won eight of their nine matches. The hosts are four points above unbeaten Valencia, who impressively beat fifth-placed Sevilla 4-0 earlier on Saturday. Real Madrid, another four points behind Valencia, host Eibar on Sunday (19:45 BST). Match ends, Barcelona 2, Málaga 0. Second Half ends, Barcelona 2, Málaga 0. Attempt blocked. Juan Carlos Pérez (Málaga) left footed shot from outside the box is blocked. Juanpi (Málaga) wins a free kick in the defensive half. Offside, Barcelona. Lionel Messi tries a through ball, but Paco Alcácer is caught offside. Attempt saved. Gonzalo Castro (Málaga) left footed shot from the left side of the box is saved in the centre of the goal. Assisted by Juanpi. Attempt saved. Juanpi (Málaga) header from the centre of the box is saved in the bottom right corner. Assisted by Juan Carlos Pérez with a cross. Offside, Barcelona. Andrés Iniesta tries a through ball, but Samuel Umtiti is caught offside. Corner, Barcelona. Conceded by Andrés Prieto. Attempt saved. Paulinho (Barcelona) right footed shot from the centre of the box is saved in the bottom right corner. Assisted by Lucas Digne. Attempt missed. Paulinho (Barcelona) right footed shot from the centre of the box is too high. Assisted by Lionel Messi. Attempt blocked. Ivan Rakitic (Barcelona) right footed shot from outside the box is blocked. Assisted by Nélson Semedo. Attempt missed. Sergi Roberto (Barcelona) left footed shot from the centre of the box misses to the left. Assisted by Nélson Semedo. Substitution, Barcelona. Paco Alcácer replaces Luis Suárez. Emanuel Cecchini (Málaga) is shown the yellow card for a bad foul. Attempt saved. Juanpi (Málaga) left footed shot from outside the box is saved in the centre of the goal. Substitution, Barcelona. Paulinho replaces Sergio Busquets. Attempt missed. Luis Hernández (Málaga) header from the centre of the box is close, but misses to the right. Assisted by Juanpi following a set piece situation. Borja Bastón (Málaga) wins a free kick in the attacking half. Attempt missed. Luis Suárez (Barcelona) left footed shot from the centre of the box is close, but misses to the right. Assisted by Sergi Roberto following a fast break. Attempt missed. Emanuel Cecchini (Málaga) right footed shot from outside the box misses to the left. Assisted by Gonzalo Castro. Substitution, Málaga. Borja Bastón replaces Adalberto Peñaranda. Substitution, Barcelona. Nélson Semedo replaces Gerard Deulofeu. Substitution, Málaga. Emanuel Cecchini replaces Esteban Rolón. Delay in match Lucas Digne (Barcelona) because of an injury. Attempt saved. Keko (Málaga) right footed shot from the centre of the box is saved in the centre of the goal. Attempt blocked. Keko (Málaga) right footed shot from the centre of the box is blocked. Assisted by Gonzalo Castro with a cross. Foul by Esteban Rolón (Málaga). Offside, Málaga. Roberto Rosales tries a through ball, but Juan Carlos Pérez is caught offside. Lucas Digne (Barcelona) wins a free kick in the defensive half. Foul by Paul Baysse (Málaga). Adalberto Peñaranda (Málaga) wins a free kick in the attacking half. Attempt missed. Luis Suárez (Barcelona) right footed shot from the centre of the box is close, but misses to the right. Assisted by Ivan Rakitic.